I am fortunate to live in an area where I am surrounded by autumn's brilliance this time of year. 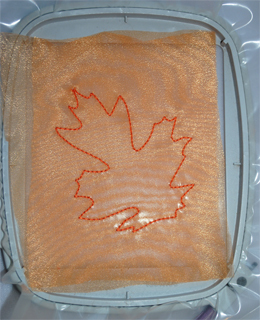 With some water-soluble stabilizer, an applique design, and organza in shades of red, orange, and gold, fall leaves can be enjoyed well beyond their typical lifespan. 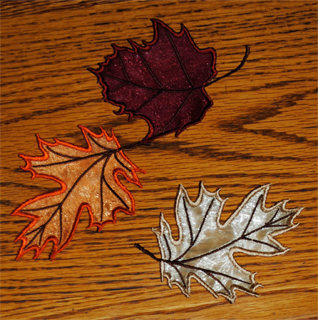 Using the same Amazing Designs Applique Leaves program that created the reversible applique towels in my last blog, you can create beautiful freestanding leaves. 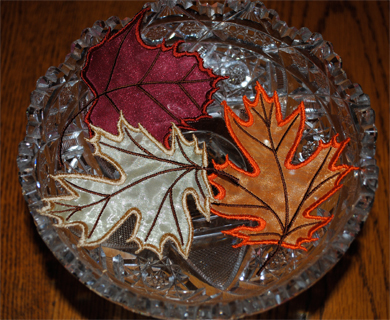 I embroidered Leaf 101 and Leaf 102. There are 19 other leaves from which to choose. I chose mirror organza which is somewhat more reflective than regular organza. Hoop a heavy duty water-soluble stabilizer like Badgemaster. Cut two pieces of organza the size of the inside of the hoop. Spray the back of one piece of organza with temporary adhesive and finger-press it to the other layer of organza. Then spray the back of the organza sandwich and finger-press it to the hooped water-soluble stabilizer. Be sure to spray in a box or over paper, newsprint, or cardboard. That way, there will be no sticky hoop! Use the same color in the bobbin as that with which you are stitching. 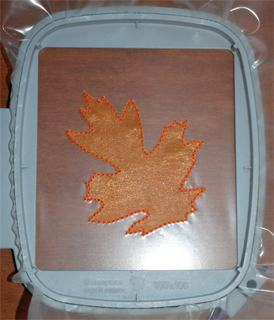 That way, the leaf will look good on both sides and will be reversible. The first stitch out is for placement and the second stitch out is a tack down. Since the organza already fills the hoop area, stitch the first two color stops on the organza. The double stitching will help hold the organza in place and add to the underlay. After the second stitch out, remove the hoop from the machine but keep the organza and stabilizer in the hoop. Carefully trim around the outside stitches with applique scissors. They allow close cutting without clipping the tack-down stitches. The final color change is the outside satin stitches. Amazing Designs provides generous satin stitching in their applique which helps ensure beautiful coverage on stand-alone edges. 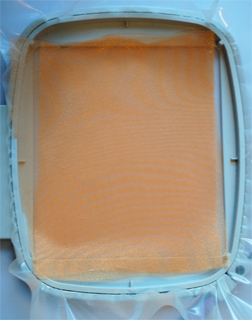 Unhoop and remove the water-soluble stabilizer. You may be able to tear it carefully from the edges of the leaves. Because these designs are not actual free-standing lace, you may want to seal the edges, especially the tips, with a water-proof, fray-check adhesive. Same thing with the stems. They were created specifically for applique on a fabric, not to be freestanding, so they do not have the same underlay as a freestanding design and may unravel without adhesive. When the fray-check is dry, rinse in warm water to remove the water-soluble stabilizer still in the stitch area. Dry flat. The organza shimmers in the light and is somewhat translucent. They are beautiful in a cut-glass bowl, made into a garland, hung in a window, or tied in a bunch with a bow. Enjoy autumn a little while longer!